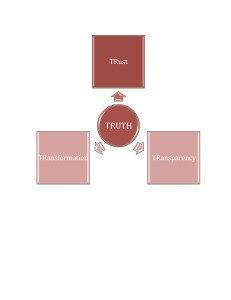 This diagram conveys the interconnected pillars or TieRs, if you will, for people to strengthen themselves within any external cause, endeavor or discipline. For example, a person choosing to pursue a spiritual dynamic in Christianity would need to focus first on what particular “truth” (Jesus Christ) to anchor him/herself. Another person might choose a particular dietary discipline such as Paleo or Atkins (Low Carb/Gut Health) as her anchor point. Our presence in this world would mean very little if we could not make sense of what occurs around us as well as contemplate what our own personal significance amounts to. So when we pursue an endeavor that changes us in some way we have latched onto a truth that ends in transformation. This change does NOT always end up being a positive change and that is an important distinction for us to consider when we decide to follow someone or something that brings “a better me”. Now, before I go into more detail about the 4 TieRs I need to state that at any given time, these components remain fluid and cyclical in nature. You don’t master one and “graduate” to another. They all must remain balanced and individual attention given to support and strengthen each TieR. So let’s talk LeadershipDude philosophy and then delve into TieR specifics. What is the problem to be considered, addressed or solved? What is the solution to rectify, resolve or complete the process? Everything that follows goes in between the two “bookends” (Portal game fans will totally get this) of problem and solution. We can adjust these two components throughout the journey but they will continue to contain and define the parameters of which actions to engage and which to avoid for successful attainment of the goal. We use this philosophy not only with our clients but also with the personal training students at the Dallas NPTI location. The fitness professionals we equip and send out leave a very different student than when they arrived. 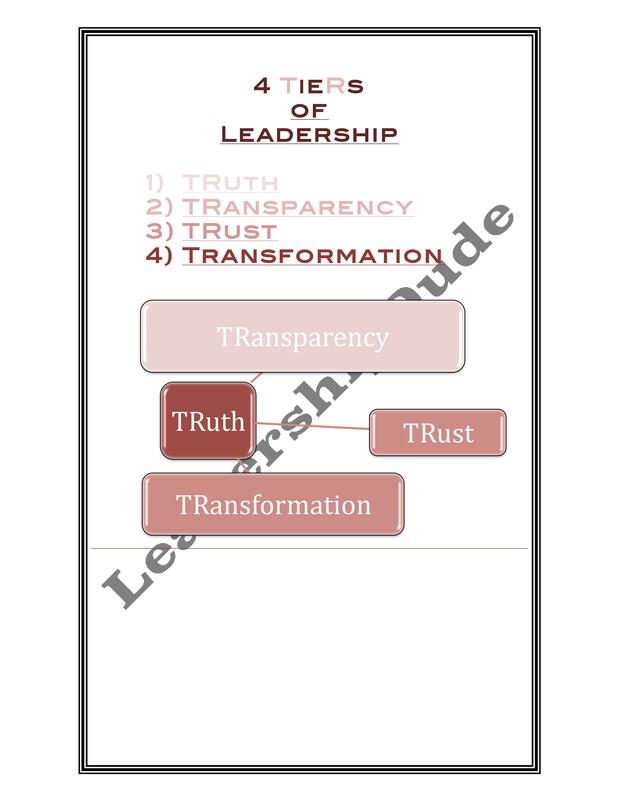 Today’s personal (fitness, spiritual, life) coach has to be able to embody the 4 TieRs of leadership in order to become successful coaches. So let’s introduce the 4 TieRs. I’ll not only share what they are but how they are relevant either in personal or group settings. I mentioned earlier that they were fluid and not necessarily in a particular order. That is both true and not true depending on the circumstance. Lets unpack this idea. We’ll choose someone in a spiritual setting who wants to engage in a pursuit of Christianity. Since our truth will set the stage for our transformation, we first need to know what our theology will revolve around. Jesus Christ sits on the throne of this conversation so that becomes our TRuth. Next, we proceed to educate and familiarize ourself with the subject of choice and begin to decide what we’re willing to receive or capable of accepting as truth. In adult learning circles (transformative learning) this is possibly the arrival of a disorienting dilemma. As you can guess, this new bit of information can make us feel uncomfortable or feel more intense negative emotions. This sets the stage for the next tier…TRust. Trust begins when the person or thing we’ve connected to is perceived as an ally rather than a potential enemy. Anyone who’s made money in sales realizes the importance of a first impression. Trust is the first rule of engagement and serves as a springboard for repeat customers. In much the same way, a person seeking to understand more about Jesus must believe a few things about Him before moving on to serious engagement with the process of becoming a believer. Will I benefit from learning about Jesus? Will I waste my time learning about Him? Are people who follow Him dumb and out of touch with reality? Will I encounter freedom from everything that has caused me to feel chained up? Once these questions and others like them have been considered, a person will feel more comfortable in moving forward with the search. 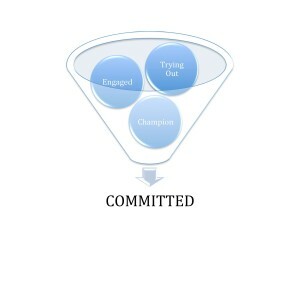 I’ve created a simple illustration to the left that shows a person moving from “trying out” to “engaged” and finally toward “Championing” a belief or principle en route to becoming a committed follower of his/her chosen pursuit. Relative to the bookend model of problem/solution, we could see Jesus as a possible answer to the problem of loneliness, guilt, perpetual sin or addiction. Joining a friend or church in order to increase or strengthen our pursuit would be a strong indication that we TRust this particular TRuth and are ready to consider being TRansparent. Transparency is the degree to which something can be seen or looked through. A muddy lake might cause unnecessary fear of a hungry alligator chomping on the legs of an unsuspecting water skier. Fear of the unknown coupled with the insecurity we encounter as vulnerable children and adolescents can lead to defense mechanisms that keep us from showing ourself to the world. Why would anyone want the world to know they were hurting or too weak to overcome a problem? No one enjoys feeling exposed and so we find ways to protect or hide those perceived weaknesses. The problem is that adults have trouble STOPPING these often harmful and/or selfish defense mechanisms and when stressful moments occur we let our old self come to the “rescue”. When a person is willing to allow himself to be transparent, he is allowing himself the opportunity to be completely honest with others that he doesn’t have it all together and could possibly use some help from others. When we cultivate a regular habit of being honest with ourself as well as with others, we discover how liberating and empowering that process can be. This is why people find strength and encouragement in getting involved with others who are seeking to understand who Jesus is. Now understand that even though we progress from one TieR to another, at any given moment we can slack off and allow one of the TieRs to grow weak or become neglected. This can lead to regression toward a previous struggle or emotional difficulty. When you notice this happen or someone shares with you that they are seeing this in you, stop and consider why. There is no need to dump burning coals on your head and feel tons of shame and guilt. Simply take an honest inventory of what is missing or needed and take action. Remember to reassess your problem and solution and make sure they are still guiding your journey towards personal strength. 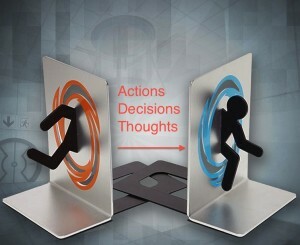 In my next post, I’ll focus on a few examples to serve as walkthroughs of the concept. Thanks again for joining us over at LeadershipDude!